We thrive on making you feel and look your best, with your success and hard work you deserve it! 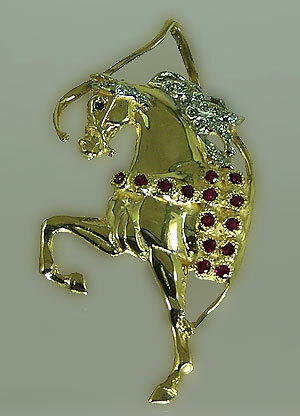 The Gorgeous Horse your number one source for Arabian jewelry! Gorgeous, gorgeous, gorgeous! We know how much work you put into getting to the Nationals. Winning the nationals is a dream come true, treat yourself to the very best in Arabian Championship jewelry! Arabian is set with rubies in a rose blanket, diamonds in the mane, and a sapphire in the eye! Dimensions: 2 1/8 inches tall x 1 1/8 inches wide. Arabian set with .20ct of matching brilliant cut diamonds, AAA quality diamond cut rubies, and a sapphire in the eye!